Russian President hosts PA chairman who complains about U.S. embassy relocation and Israel's "settlement policy". 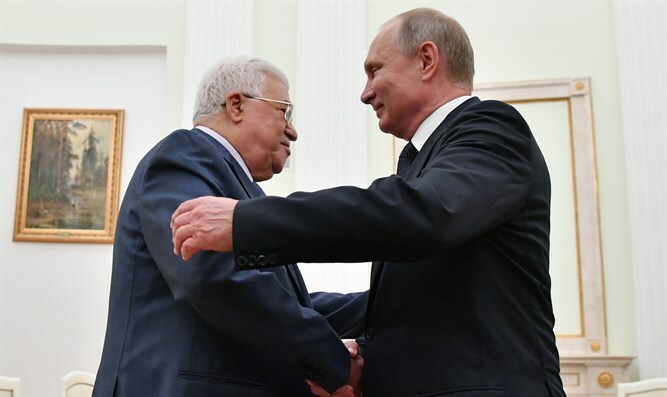 Russian President Vladimir Putin on Saturday hosted Palestinian Authority (PA) chairman Mahmoud Abbas, reported the Xinhua news agency. The two discussed bilateral relations and the situation in the Middle East, the Kremlin said. "We are happy to have this opportunity to hold consultations with you both on bilateral relations and on the situation around Palestine, near Palestine, on regional matters," Putin said prior to the meeting, according to a transcript provided by the Kremlin. Putin noted the situation in the Middle East is complicated and said he would gladly inform Abbas of his contacts with leaders of other countries in the region. Calling Russia-PA relations "truly special," Abbas praised the constant development of bilateral cooperation of the two countries and their regular discussions on regional issues, which provides useful advice for the Palestinian side. Abbas reportedly also complained to Putin about Israel's “settlement activity”, according to Xinhua. "Israel's settlement activity is a problem representing the biggest importance for us, as this is very dangerous. We try to use all possible means to oppose their actions," he was quoted as having said. Abbas also voiced his concern over the U.S. decision to relocate its embassy to Jerusalem. "We oppose the attempts of the Americans to impose their resolution of the most pressing Palestinian problems. This has resulted in the break of our contacts," Abbas was quoted as having said. The meeting between Abbas and Putin came three days after Putin hosted Prime Minister Binyamin Netanyahu in Moscow. The two mainly discussed the situation in Syria. Putin has in the past expressed a willingness to host Netanyahu and Abbas for a bilateral meeting in an attempt to revive the stalled Israel-PA peace talks. Abbas has continuously chosen to impose preconditions on talks with Israel rather than heeding Prime Minister Binyamin Netanyahu's call to negotiate. The PA leader met with Putin in February, two months after U.S. President Donald Trump recognized Jerusalem as Israel’s capital. At the time, Abbas told Putin he could no longer accept the role of the United States as a mediator in talks with Israel because of Washington’s behavior.